36V advanced high-power Lithium Ion battery. Super lightweight battery: only 13 pounds, less than 1/4 weight of a similar lead acid battery. Note: M8 Red and M8 Black Terminal Posts are optional and not included with standard package. Need to purchase separately. 200W AC charger can fully charge battery in 5 ~ 6 hours. Only use this battery with devices that can accept every voltage in the 30-42V range and require 1200W or less power. This battery output voltage range is 30V ~ 42V. This output voltage can be converted to different voltages to meet different needs by using DC to DC power converters. Using a Lithium-ion battery offers many advantages over older SLA (Sealed Lead Acid) batteries because of Lithium-ion's high energy density, small size, and low weight. A typical Lithium-ion battery only weighs 1/4 of and is 1/2 the size of a same capacity traditional heavy bulky Sealed Lead Acid battery. BiXPower Lithium-ion batteries are made with premium brand Lithium-ion battery cells. We have some of the lightest and most powerful replacement batteries available with top quality. Compared to lead-acid batteries, BiXPower Lithium ion batteries have a much slower self-discharge than the best lead acid batteries. This means that they can still work even if the remaining capacity is low. 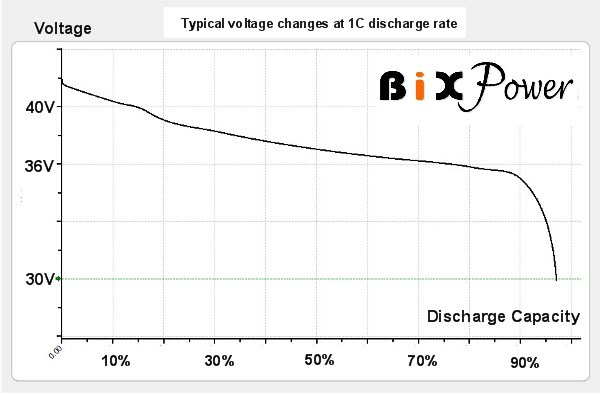 A fully charged BiXPower Lithium ion battery can sit for a year or more and still retain adequate capacity, without damaging the battery. No explosive gasses during charge, no lead, no acid, environmentally friendly. This battery is perfect for devices that need up to 1200W power, such as the 36V motors in electric scooters and electric motors.